When Chevrolet FC posted images of a soccer pitch they had rebuilt for a poverty-stricken school in Gauteng, a few online users were unimpressed. Where was the grass on the field, they asked. 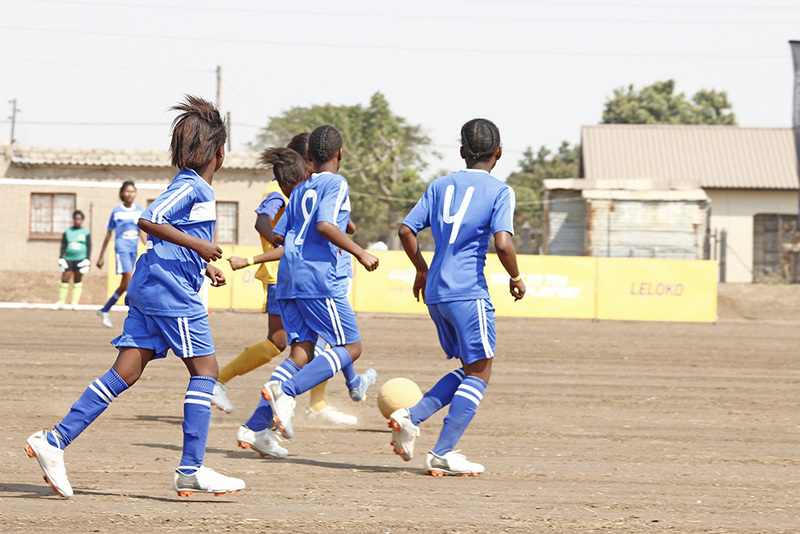 Chevrolet captioned their photographs, saying the rebuilt soccer pitch would empower girls from Mabu-a-tlou Primary School in Hammanskraal, a rural community. But the grassless pitch provoked ridicule, with people asking if this was the best Chevrolet could do for the countryâ€™s poor. @ma_Ndosi yeah its doesn’t make sense, they have to build a european standard pitch. Chevrolet FC, a division of Americaâ€™s General Motors car manufacturing giant Chevrolet, sponsored the pitch renovations to the tune of â€œhundreds of thousands of randsâ€ under its â€œWhat Do You #PlayFor?â€ global campaign, according to Gishma Johnson, corporate communications manager for General Motors South Africa. The pitch itself was built by the Dreamfields Project, a non-profit organisation that provides soccer resources to rural and township communities. General Motors said the initiative aims to empower underprivileged children, but had Chevroletâ€™s grassless pitch accomplished this goal or had it ripped off a poor community? Africa has long been a focus for global activists looking do some good but in many cases misguided aid efforts have done more damage than good. In 2010 for example, American businessman Jason Sadler tried to help Africa by collecting one million t-shirts and donating them to Africans. Sadler had never been to Africa and failed to recognise that many Africans do have t-shirts. Worse, he failed to anticipate that flooding the market with free t-shirts would put already poor Africans who made their living selling t-shirts out of business. This is just one example of what has come to be known as â€œbad aidâ€ â€“ an aid effort that hasnâ€™t been thought all the way through. Â Was Chevyâ€™s sand pitch another? In the case against Chevrolet however, Internet users may have been too hasty in their criticism of the grassless field. Chevrolet, it turns out, had actually thought further than the publicity stills and its decision to set up a sand pitch instead of a grass one was a considered one. â€œThis community barely has enough water to drink. You canâ€™t make a commitment to put a grass field in if you donâ€™t know how youâ€™re going to water it,â€ Perlman said. â€œWith a grass pitch, they would need to refertilise it, aerate the fields and put new topsoil on. It could cost between R40,000 to R50,000 a year,â€ he added. The Mabu-a-tlou Primary School and the Hammanskraal community will take over the maintenance the field after the first three months. This will include brushing the surface, re-marking the lines, and raking the field to maintain a level pitch. Nancy Phale, a teacher at Mabu-a-tlou Primary School toldÂ theÂ Daily Vox thatÂ the school would not have had the funding to maintain a grass pitch and that the sand pitch installed was a vast upgrade from the previous playing field, which was overrun with weeds and thorns, and littered with broken bottles. Phale said the children were â€œover the moonâ€ and â€œso excitedâ€ about the new pitch. â€œEvery day our children are at the soccer field after their lessons,â€ she said. While well intentioned, the outpouring of outrage on behalf of Hammanskraalâ€™s children may have been misplaced and desktop activists would do well to remember the lessons of bad aid.